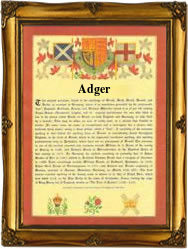 This interesting surname with spellings which include Edgar, Eager, Eagger, Egar, Egarr, Eger, Adger, Agar and Agar, is Olde English. It derives from the pre 7th Century personal name "Eadgar", composed of the elements "ead" meaning prosperity or fortune, plus "gar", a spear. The personal name is found in Middle English in various forms, for example Edgar, Adger and Agar. The surname dates back to the early 13th Century (see below), and further early recordings include: Walter Elgar (1234), in the Feet of Fines of Suffolk; Thomas Algor (1260), recorded in the Assize Court Rolls of Cambridgeshire; and Robert Eger (1271), in "A Descriptive Catalogue of Ancient Deeds of Norfolk". Recordings from London Church Registers include: John Agar, who married Elsabeth Holmes on August 12th 1544, at St. Margaret's, Westminster; Margaret Ager, who was christened on August 22nd 1544, also at St. Margaret's, Westminster; and William, son of Thomas Adger, who was christened on February 10th 1596, at St. James Garlickhithe. The first recorded spelling of the family name is shown to be that of William Algar, which was dated 1221, witness in the "Assize Court Rolls of Worcestershire", during the reign of King Henry 111, known as "The Frenchman", 1216 - 1272. Surnames became necessary when governments introduced personal taxation. In England this was known as Poll Tax. Throughout the centuries, surnames in every country have continued to "develop" often leading to astonishing variants of the original spelling.